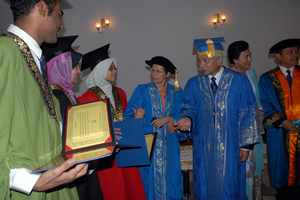 BANGI, 7 August 2010 – UKM’s Chancellor said the university need to concentrate on character building of its students apart from providing them with the requisite education. This was to ensure that UKM graduates will not only have the intellectual excellence but also good moral grounding so they can lead the world to a better future. The first session today apart from conferring doctorates to 233 scholars from all its faculties also saw the conferment of awards to students from the Engineering Faculty in Micro Engineering and Nano Electronics. The Chancellor said such a mission in character building of its students in the context of globalisation has placed UKM on the world stage with its own mould in human capital development thereby making UKM a symbol of scholarship and knowledge. UKM needed to uphold that challenge. This is to enable it to stand side by side with World Class Universities but yet able to maintain its own values. 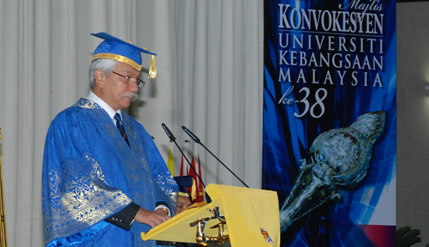 UKM must be ready to take on the challenges of an increasingly global higher education scenario. 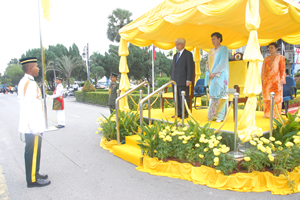 Also present at the Convocation Ceremony are the Tunku Ampuan, Tuanku Aishah Rohani bt Almarhum Tengku Besar Mahmud, the Vice Chancellor, Prof. Tan Sri Dr Sharifah Hapsah Syed Hassan Shahabuddin and senior university officials.